Last week, 9th-grade students studying Ancient World History had the opportunity to visit the Escondido Wat Thai Buddhist Temple and Shiva Vishnu Hindu Temple in Mira Mesa. 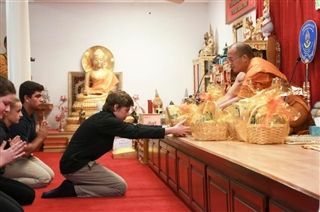 Students spoke with monks at the Buddhist temple about their religion and explored the compound's gardens, taking notes about the shrines on display. At the Hindu temple, students learned about Hindu deities and rituals. The day ended with a visit to Rasraj Indian Restaurant for snacks of dosa and chaat. Spending time at the temples helped students understand how some of the history they are studying links to modern religious practices, and allowed them to learn about vibrant cultures that may be different from their own.